I recently traveled with relatives who wanted to visit Universal Orlando for two days. 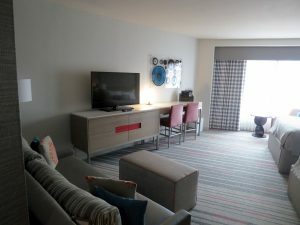 To maximize that time, I decided to book a room for one night at one of Universal’s deluxe hotels in order to enjoy two days of Early Park Admission and Unlimited Universal Express. Book the cheapest hotel room that will hold 4 adults and 1 kid (those who would use Universal Express). Arrive before park opening on check-in day to get Universal Express and enjoy Early Park Admission at one park. Check out early the next day in time to enjoy Early Park Admission at the other park. 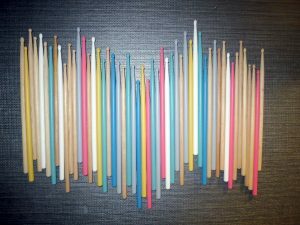 Use Universal Express wherever possible in order to breeze through attraction lines. The plan mostly worked well, but weather and my group’s stamina prevented us from doing everything in the Universal Orlando parks during those two days. 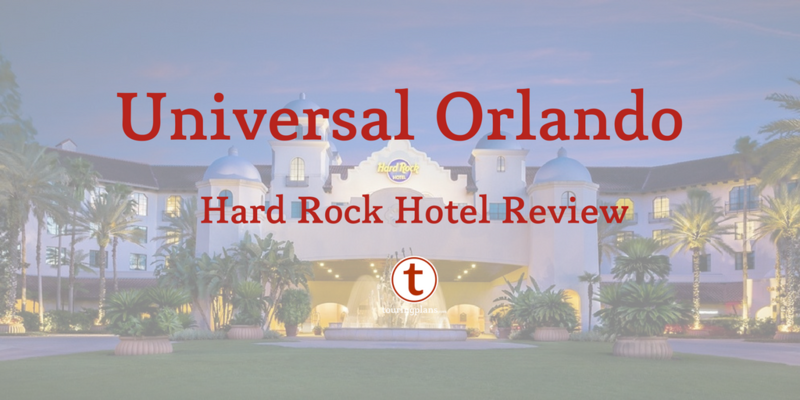 This article focuses on Hard Rock Hotel and the stay’s impact on touring the Universal Orlando theme parks. There are several Hard Rock Hotel locations in the world. Like the other on-site Universal Orlando hotels, this location is run by Loews. (Hard Rock has its own Rock Royalty loyalty programs, so you cannot utilize the Loews YouFirst program here.) This is a resort-style hotel, with a snazzy pool, organized activities, several restaurants, a fitness center, and more. Hard Rock offers a 500-square-foot “Deluxe Queen” room that sleeps 5 in two queen beds and one sleeper, so that fit my group at the lowest cost. Proximity to the theme parks (Universal Studios Florida is about a 10-minute walk). These rooms are not cheap, but people willing to pay for a Disney Deluxe hotel should not bat at an eyelash at the prices. For example, on a random Wednesday in September (a slow time), Hard Rock charges $387.00 (plus taxes, and that does not include parking) for a Deluxe Queen, pushing the total cost to near $450 per night. And if you only need 4 people to fit, smaller rooms are available for about $50 less. The hotel has a too-cool-for-school vibe, with a soundtrack playing in the elevators synced up to the music video playing on a giant video screen in the lobby. 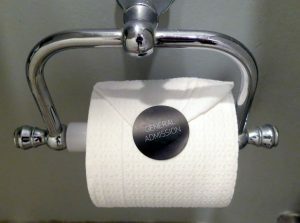 The “Hard Rock” name and assorted clever slogans are all over the place, from pillows to K-cups to toilet paper. The text messages I received from the hotel always ended in “Rock On!”, and at check in I was given a code for an online music download. I also was told that I could rent a guitar. These last touches seemed a bit silly to me (who wants to sit in a hotel room and play guitar when there are theme parks to explore? ), but they’re clever. The room, itself, was nice. It’s a functional, modern hotel room with power outlets in handy places, and it was spacious. Staff were polite, and a real crib (not a pack-and-play) was delivered to my room promptly upon request. My only criticism of the room is that the paint was bubbling near the showerhead. (I’ve seen this sort of thing at several “nice” hotels in the past.) Outside my room, two bags of dirty towels were left in the hallway near my room for at least 6 hours on my first day. 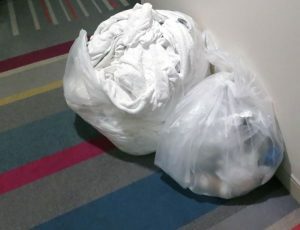 That detracted from the slickness of the decor and was obviously a sloppy move by staff, but the bags were removed overnight. I also concluded that most “rock stars” must opt for valet since my room keys (which worked fine on the room) never worked with entry and exit to self-parking, despite my explicitly asking for confirmation that they would work for parking (at a cost of $22 plus tax) when I took receipt of the keys. I was able to press a button and talk to a parking goddess voice who would open the gate for me, but something was not working right, and no one fixed it. I got the impression this was a common occurrence. Universal Orlando hotels do a great job communicating with guests via text message. I received a message in the afternoon once my room was available, and at the end of my stay I checked out via text. On my first day, I would have preferred not to have to return to the check-in desk again in the afternoon (which then had a line) to retrieve real keys. Why couldn’t they simply make the key cards they gave me in the morning work? Overall, though, it’s a great hotel if you’ve got the cash and want to experience Universal Orlando. Portofino Bay and Royal Pacific try to transport you to a different part of the world with their environments, but Hard Rock Hotel instead instead works on your frame of mind. I didn’t feel like a rock star, but the place had a hip, fun vibe (or at least it seemed that way to boring me), and it was pleasant to be there. Obviously getting to a hotel super early and needing to stow luggage (or leave it in your car) is a bit of a pain, but if you’re able to do this, getting two days of Universal Express out of a single-night hotel stay is definitely possible. Universal Express waits were quite short (less than 5 minutes on average) throughout my visit, so that was a wonderful advantage. 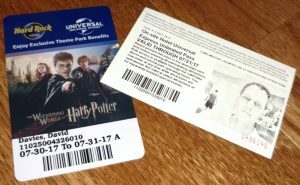 About a month before my trip, the Harry Potter attractions in both parks started accepting Universal Express, so it greatly reduced my need to use Early Park Admission. I used it on my first day to reduce my wait for the Gringotts coaster, but I didn’t see a point in taking advantage of it on my second day, so we slept in a bit. I have been to the Universal Orlando parks several times. There is plenty to do, and I missed several big attractions in my two days. It would, however, have been possible to experience everything with more a “commando” approach. In my case, I was touring with kids and a pregnant person, and they wanted crazy things like rest, sleep, dryness, food, time together as a family, etc. Still, we accomplished plenty on two rainy summer days, and that would not have been possible without Universal Express. Simply put, this plan works to get “cheap” Universal Express access for a family. On the days I was there, the Unlimited Universal Express access would have cost $90 per person per day, so I got $900 of “value” from two days of that benefit alone. Plus, I had a snazzy and well-located room, as well as Early Park Admission. This is definitely a value power play that gets you a lot of Universal in a short time period. That said, the process was a pain. Moving to Universal Orlando for only a single night takes some effort, especially with small children. Furthermore, my party took lots of breaks, enjoyed long meals, and retired early in the night. 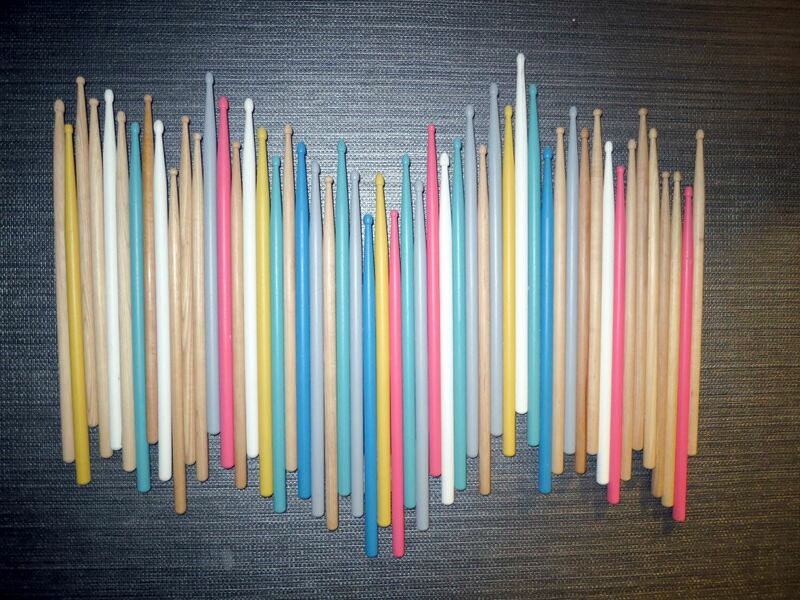 As a result, we did not take advantage the hotel’s many amenities, and we missed several things in the theme parks. 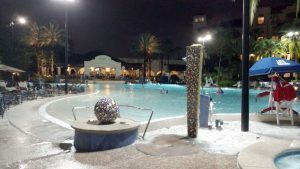 We absolutely did more than we would have had we stayed elsewhere and driven to Universal for the day, but I personally would have preferred to explore at a slower pace; for my group, spending an additional day or two at the hotel would have been better. I think the “stay at a Universal Deluxe for one night” approach works best if you’re a nimble group with the stamina to do non-stop touring. Or it could work if you highly value experiencing a specific portion of Universal Orlando (like the Wizarding World of Harry Potter areas) and don’t care about “wasting” any other amenities that you purchased. Each group is different, and we all need to consider what works best for us. Have you stayed at a Universal Orlando hotel simply for the benefits of Universal Express or Early Park Admission? Let us know in the comments. Yeah I did this back in 2014 it was well worth it even during a slower time of time of year we did all the attractions we wanted multiple times with no wait!